Blinded as a young boy and imbued with extraordinary senses, Matt Murdock fights injustice by day as a lawyer and by night as the superhero "Daredevil." Netflix does not release any kind of viewership information for its original series. Yes, the Nielsen ratings system may be comically outdated and unreliable, but Netflix has direct access to its statistics and could easily provide real info about its shows (about anything at all it offers, really). However, other companies have tried to figure out some of Netflix's numbers, with the San Diego-based Luth Research estimating that more than 10% of US Netflix subscribers watched Daredevil in its first week and a half of availability - and that wasn't even counting those of us who watched it via Smart TVs or game consoles! Basically, Daredevil was a verified hit right out of the gate, and now Hasbro's turned him into a toy. Matt didn't start out with a costume - in fact, while one of the running threads of Season 1 was him developing the personality he'd use as a hero, another was him collecting the metaphorical pieces of his costume, finding the scientific advancements that would grant a guy with no physical enhancements the protection he'd need on the streets. The detailing in the sculpt is outstanding, capturing not just the complex pattern of the suit (a mix of stiff armored panels and knife-proof flexible cloth) and the realistic wrinkles, but also the fine, woven texture of the material it's made from. Presumably this is a digital sculpt, but how is Hasbro's so much better than anything Mattel can manage? 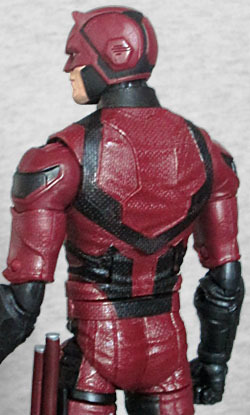 Daredevil's costume was redesigned slightly for Season 2, but this toy represents the Season 1 look - the easiest area to tell is the mask, because his first version had red panels on the sides, including space for his ears, while the second one leaves the entire side black. The head sculpt feels slightly too round, but it's appropriately grumpy. When the first images of Matt's costume leaked out, internet commentors who couldn't understand the concept of "scenes in television shows are lit for dramatic purposes, not clear display" complained that it looked purple. Sometimes you just want to give people a sad pat on the head and a glass of milk before their nap, don't you? Needless to say, Daredevil's costume is red, not purple. Mostly red. The armored parts are red, while the flexible parts are black. What, can his tailor not make the cut-proof fabric in any other colors? Does it lose its effectiveness if it's dyed? 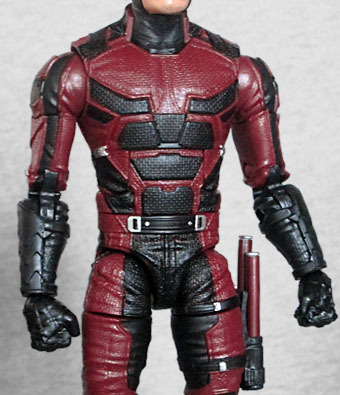 This ends up looking a bit like the "stealth" costume DD wore in Secret War, but yeah, more red would be better. They did a good job painting the toy, even on the small silver buckles, but his lips seem extra pink for some reason. 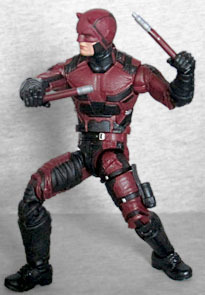 Daredevil stands more than 6¼" tall, because Hasbro actually grasps the concept that its live-action toys are going to be played with alongside its comicbook toys. He also has as much articulation as any other Marvel Legend, with joints in the head, neck, shoulders, biceps, elbows, wrists, chest, waist, hips, thighs, knees, and ankles. He doesn't have any shin swivels, but did you even notice them missing from that list until we said it? The hip balljoints have a little bit of wiggle to them, and the knee hinges are minorly soft, but those are minor issues. He's the right size and he moves well. Like many a Daredevil, this one's only accessories are the two halves of his billy club. They can be plugged together to form a single weapon, or pulled apart for dual-wielding. When not in use, they can fit (tightly) in the holster on his left thigh. The toy has two pairs of hands: one designed to hold the clubs, the other closed fists. This series does include a Build-A-Figure, but no, it's not Vincent D'Onofrio's Kingpin. So sad! Instead, it's Man-Thing, because this series is technically "Marvel Knights"-based, not Netflix-based (even though we've all been calling it "the Netflix series" since it was announced). Daredevil gets the head, with its familiar face-roots. Too bad they didn't give him one of the arms, because as "The Man Without Fear," Daredevil is one of the few people who wouldn't burn at Man-Thing's touch. Daredevil perfectly captures the difference in quality between Hasbro and Mattel. 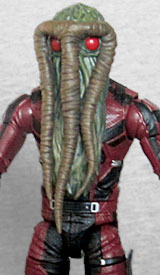 While Matty's movie and TV toys are soft-sculpted garbage, the 'Bro gave fans a toy that's among the best of their work.